After my pretty chilled out time in the Air New Zealand lounge, I headed through the terminal, and over to the gate where boarding was already in progress. 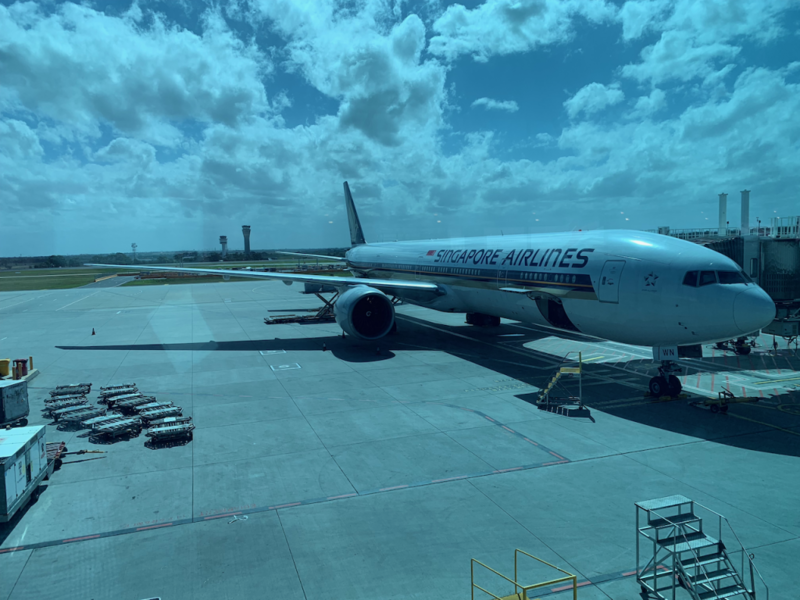 The flight was being operated by a Boeing 777-300ER, which had the previous generation of seat, compared to the latest one that I reviewed on my outbound journey to Sydney on the A380. 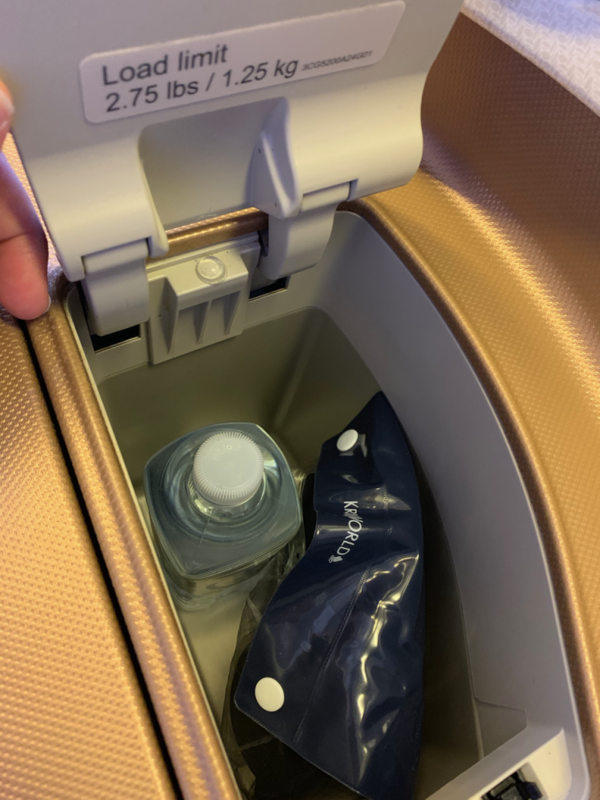 I have actually reviewed this product on a flight from Singapore to Sydney back in 2017, however it was after a rubbish nights rest trying to sleep in the lounge at Changi airport. 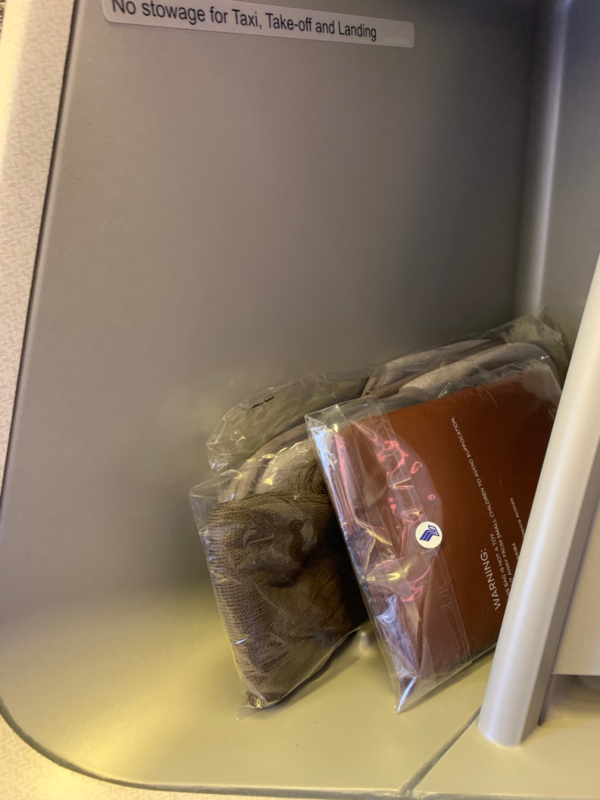 Lesson learned – pay for an airport hotel! 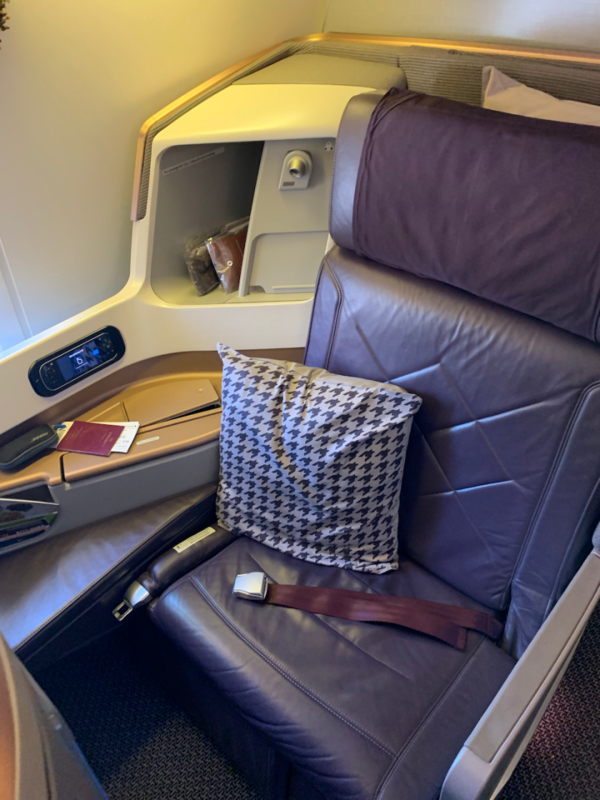 The business class cabin is split into two sections – there’s three rows in the ‘A’ Zone, between doors 1 and 2, immediately behind first class, and then a much larger cabin from doors 2 to 3. 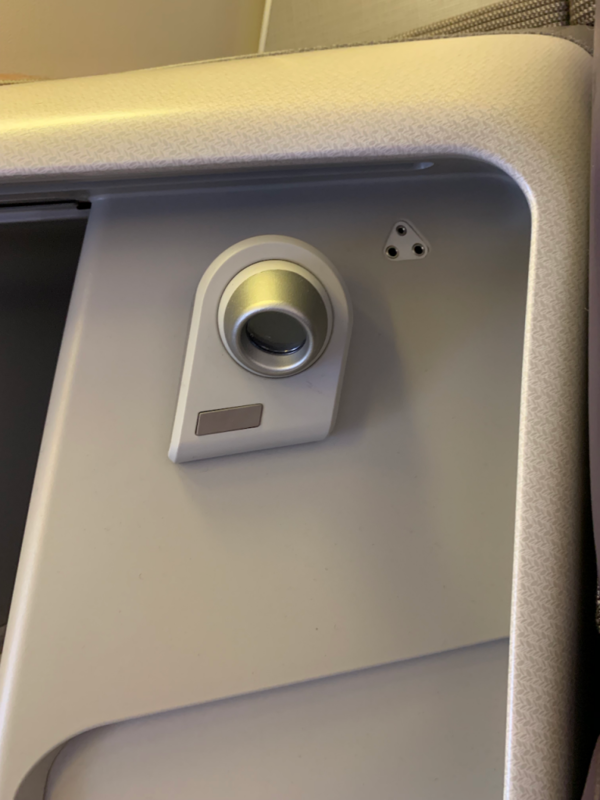 I was lucky enough to have seat 14K, in the much more private mini cabin at the front. 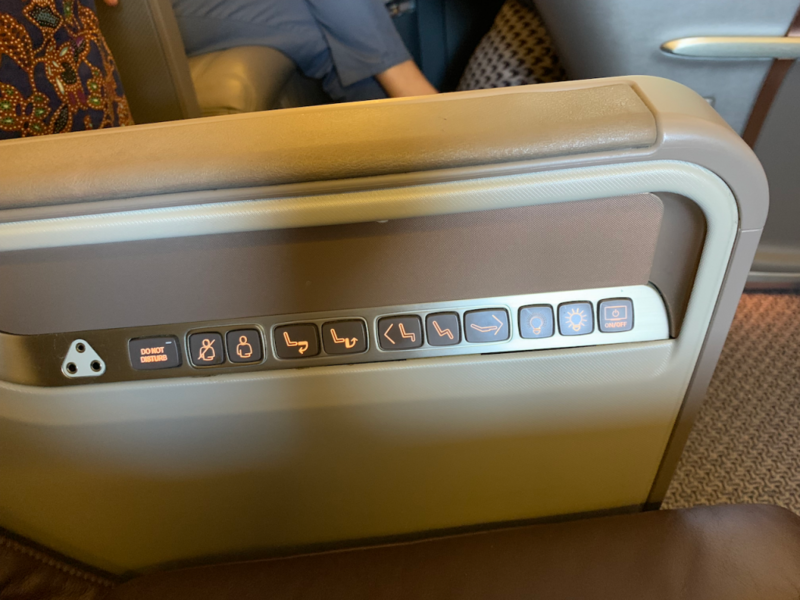 For those not used to Singapore Airlines seat, they are configured in a 1-2-1 formation, ensuring every seat has direct aisle access. 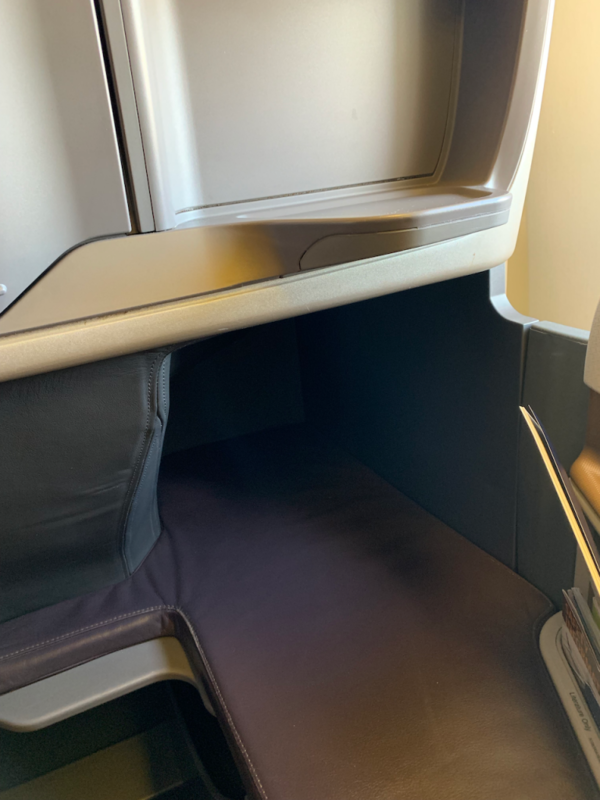 Your feet go into a little cubby in the one in front, but you do have to sleep at an angle when the seat is flat. I personally don’t mind this, but some people do. The other thing about this slightly older product is that to switch to bed mode, you have to get out, and flip it forward, as opposed to simply reclining. Again, I don’t mind this, but some people hate the fact they can’t recline all the way back from seat through to bed. 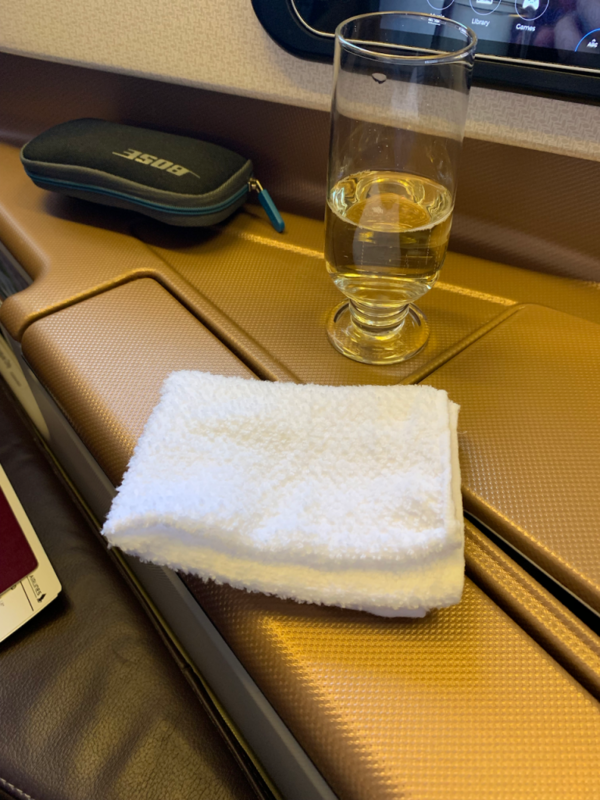 Within about 30 seconds of arriving at my seat, my jacket had been hung, and I had a glass of champagne in my hand. They were serving a Charles Heidsieck Brut Reserve, which was quite pleasant. It was perhaps about thirty minutes before we were ready to push back and head off to Singapore. 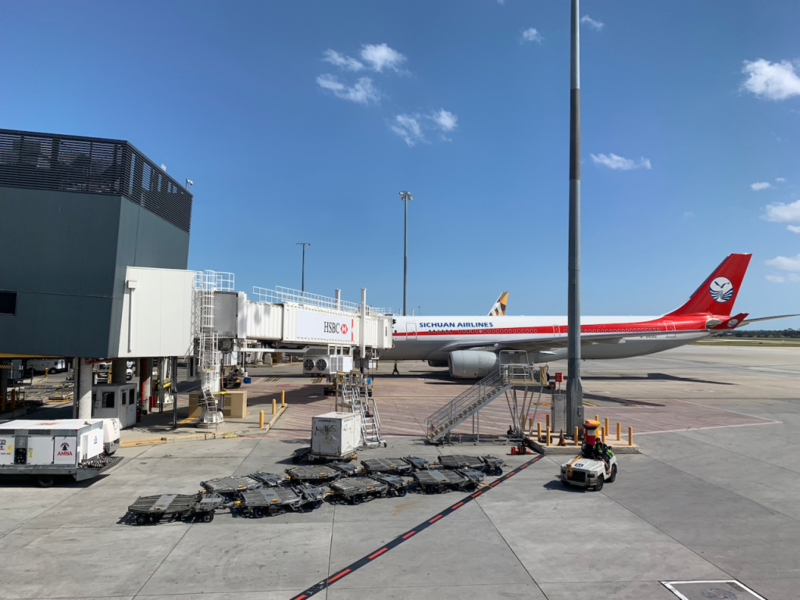 Parked at the gate next to us was a Sichaun Airlines aircraft – not an airline that makes it to the UK. 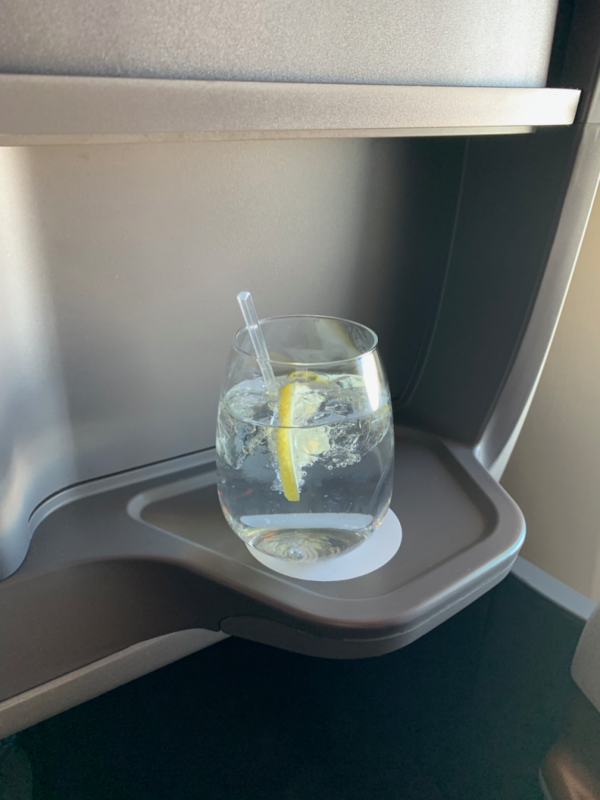 Before we took off, I was asked what I wanted to drink and being the terrible creature of habit that I was, asked for a gin and tonic. 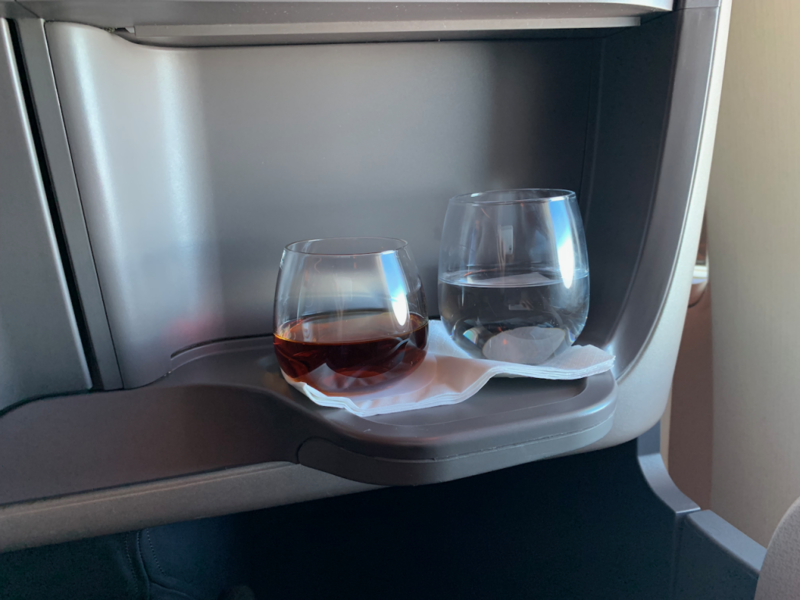 Within fifteen minutes of wheels-up, I had one in my hands (along with a bowl of nuts). 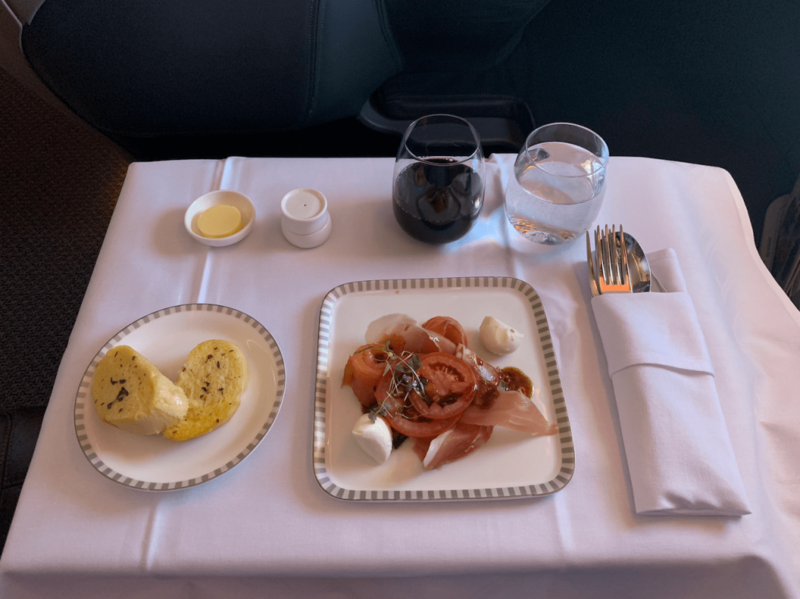 I’ll give it to Singapore Airlines, the service is very polished and efficient. The dinner service started soon afterwards with my table being laid. The starter was an antipasto plate, which was offered with some bread. 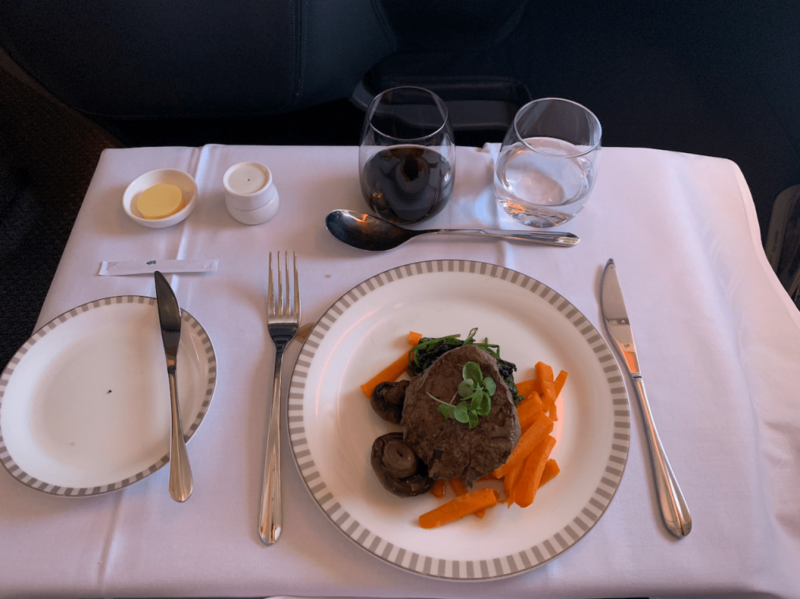 For my main course, I’d opted for the beef fillet. It was over-cooked for my liking (my preference is for still moo-ing), but still a little pink inside, and not tough at all. 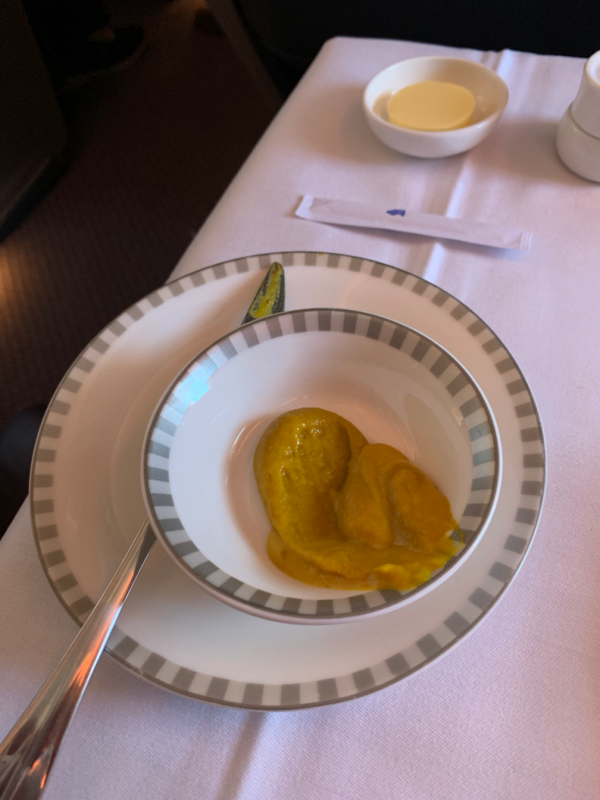 They even had some Dijon mustard to go with it, served in a little bowl as opposed to a sachet. Dessert arrived which turned out to be an almond chocolate cake. Nom. 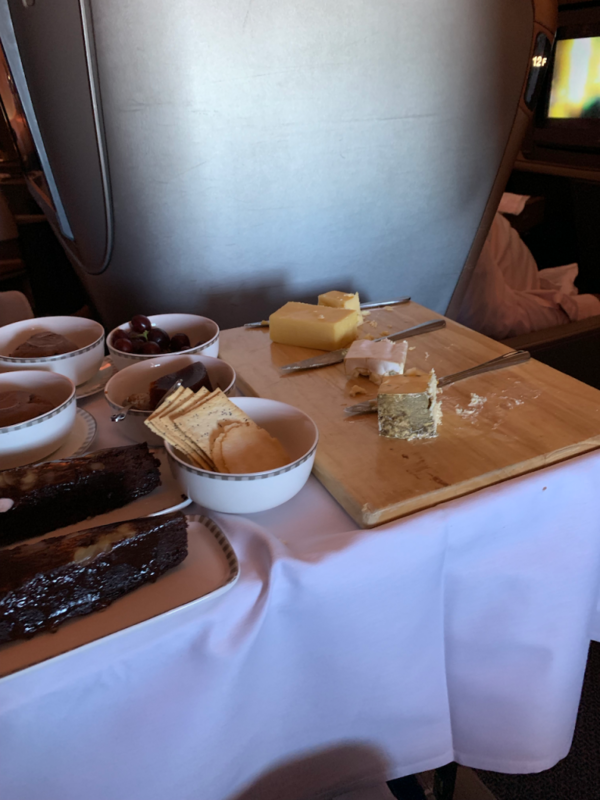 As if I wasn’t full enough by this point, the cheese trolley arrived. Purely fore review purposes, I felt it would be rude not to sample them along with an apple for the pretence of feeling healthy. 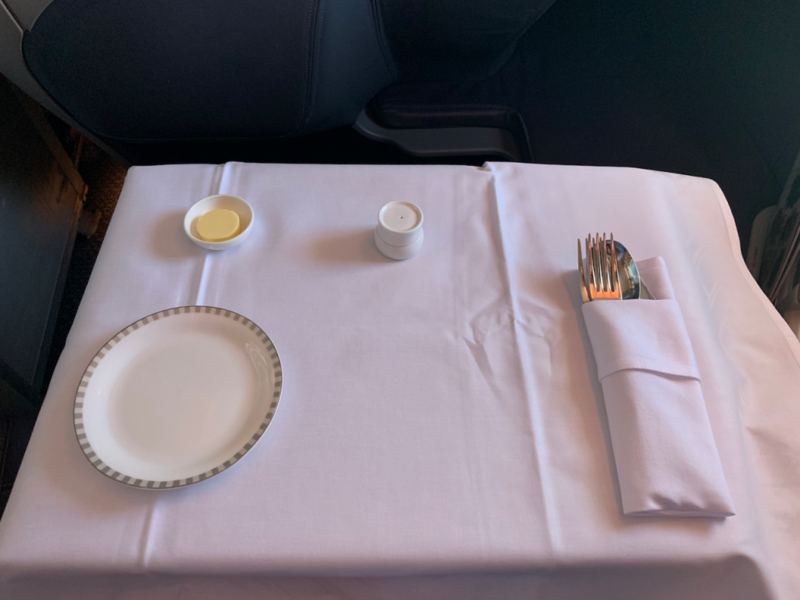 The cabin crew by this point had cleared everything away, but came back offering digestifs. 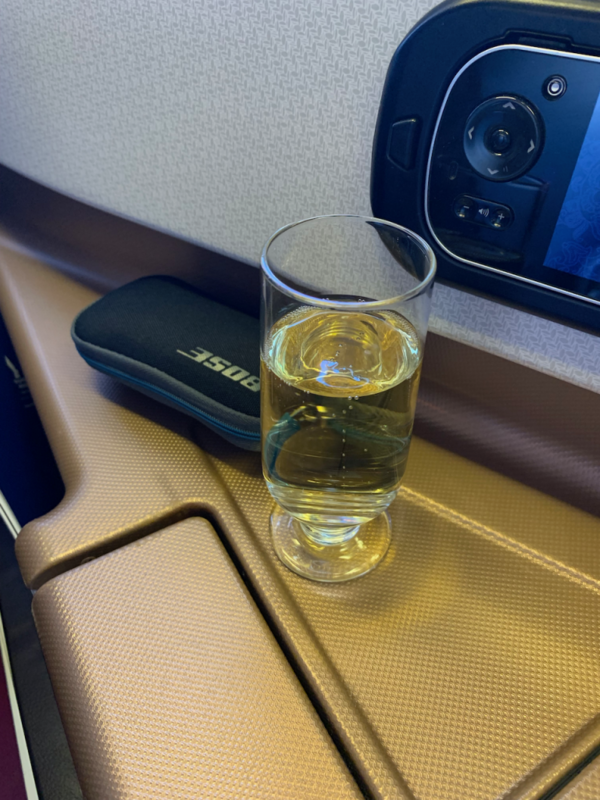 As Singapore Airlines service Courvoisier XO in business class, I felt it would be rude to turn down such a lovely drink and the crew came back with a rather large measure. After all that, I thought a nap was probably in order. The crew turned my seat into bed mode and the rest of the flight was a bit of a blur. 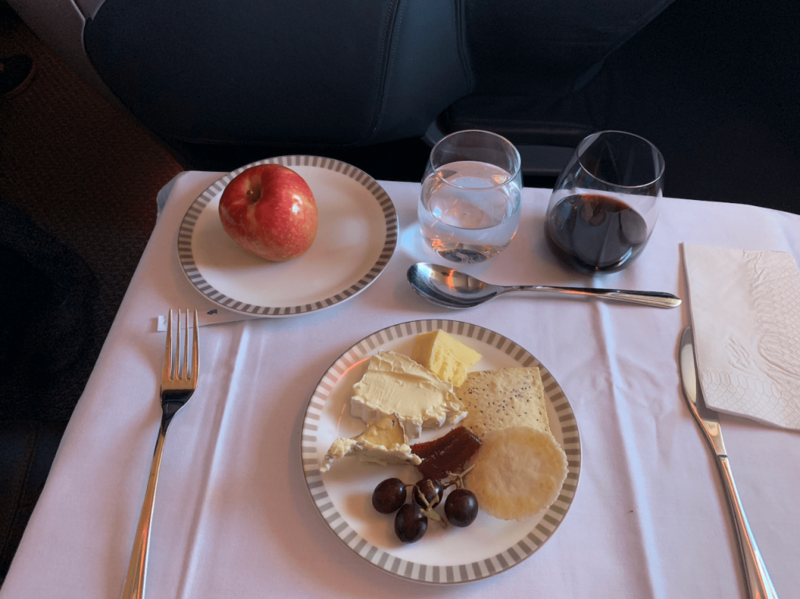 I missed the second meal service and awoke roughly 45 minutes out of Singapore. 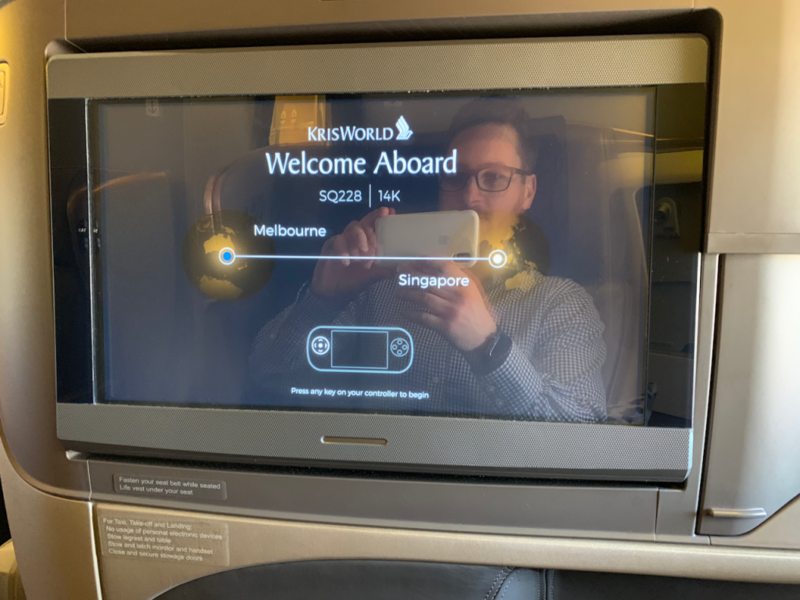 Singapore Airlines are a class act, there’s no doubt about it. The seat divides opinion but I had no problems sleeping (well, passing out) on it. The crew are also top-notch, but perhaps don’t have that little bit of familiarity that the best European or Australian can sometimes deliver. The food and drinks were great too. 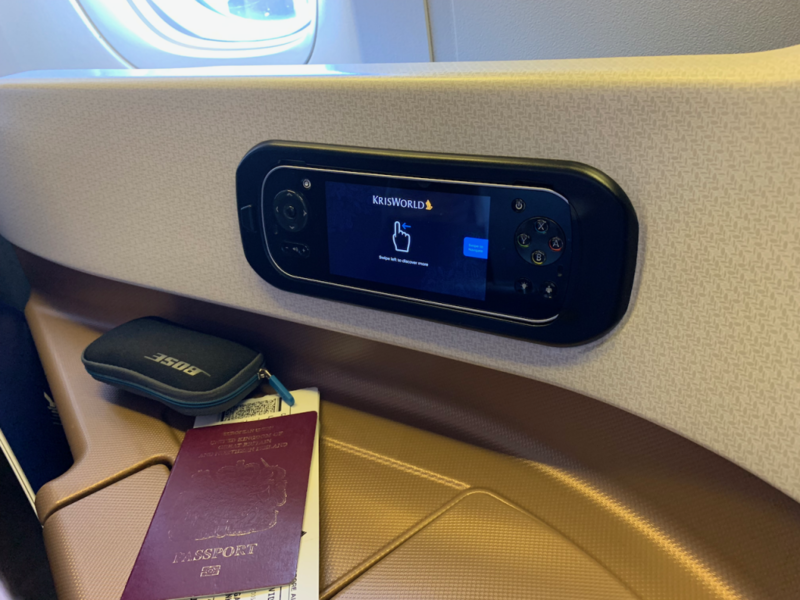 They have the best in-flight entertainment and internet I’ve used on an aircraft (although I have to confess I haven’t yet flown Emirates), so adding everything up, not sure there’s much else I could have wanted on this sector of the journey. 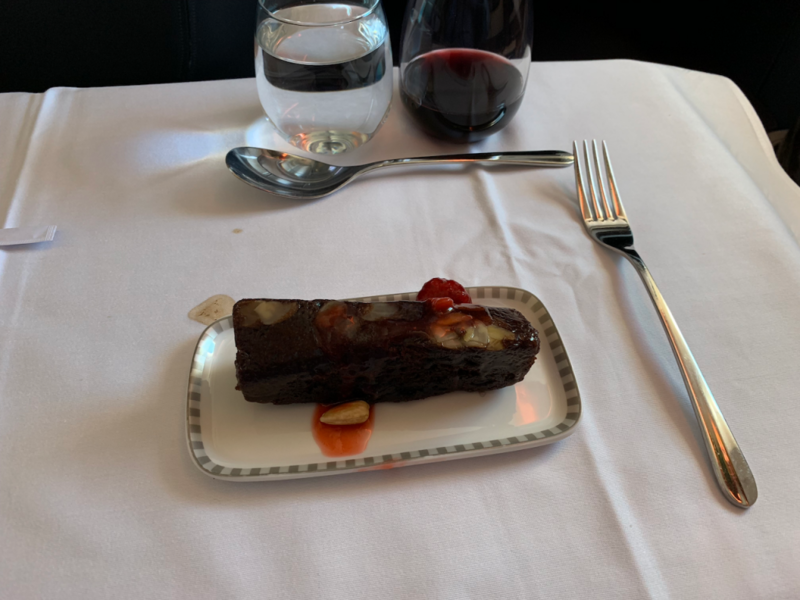 Previous Post: Air New Zealand Lounge. Melbourne. 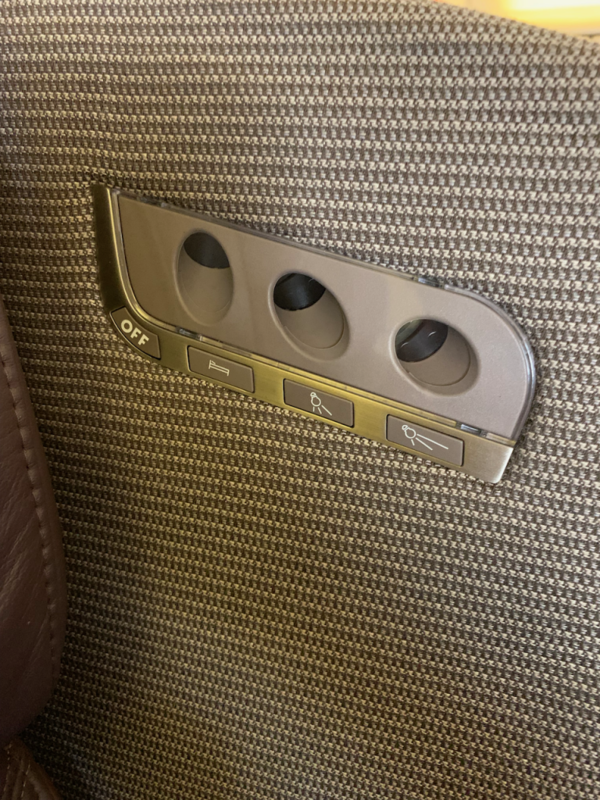 Next Post: Lufthansa A380 Business Class. 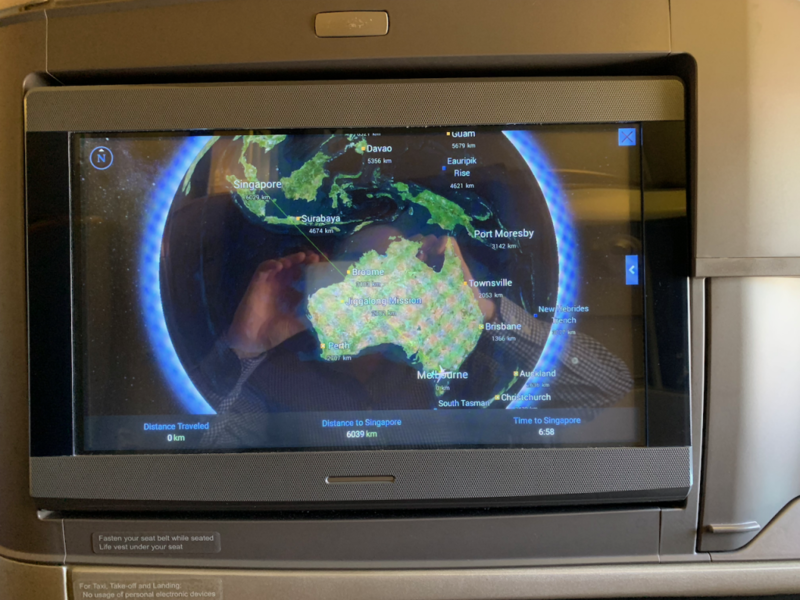 Singapore to Frankfurt.